Online giving is critical for churches. This is not news. But how do you set it up? Or, maybe a better question to ask is how do you set up online giving easily? 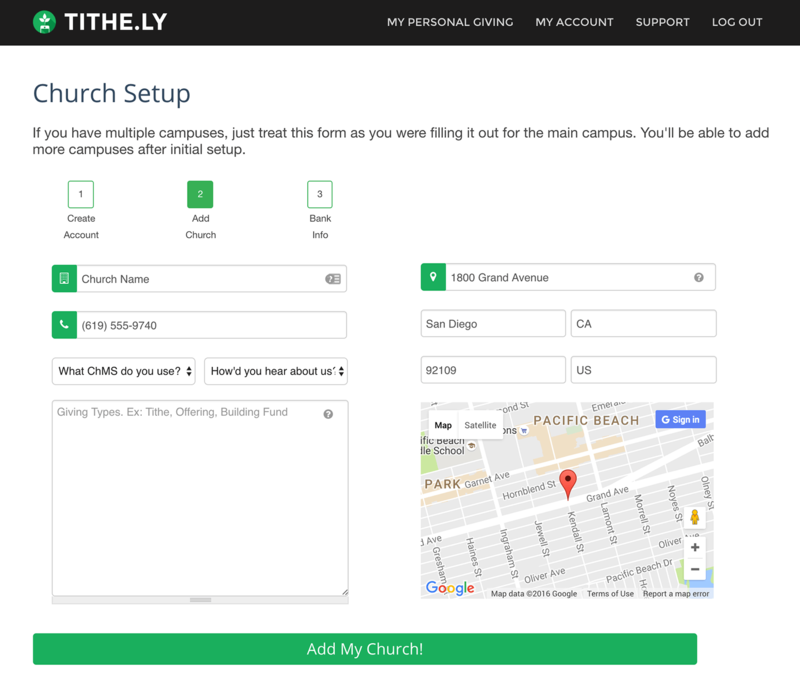 Many of our church WordPress theme users have already discovered Tithe.ly. Now we want to make sure all of our users know about it. First I want to tell you what is great about Tithe.ly then I’ll walk you through setting up your account with them and adding a “Give” button to your WordPress-powered church website. There are several reasons we like Tithe.ly. The cost is 1% + $0.30 for payments from the giver’s bank account or 2.9% + $0.30 per credit or debit card transaction (American Express transactions are 3.5% + $0.30). 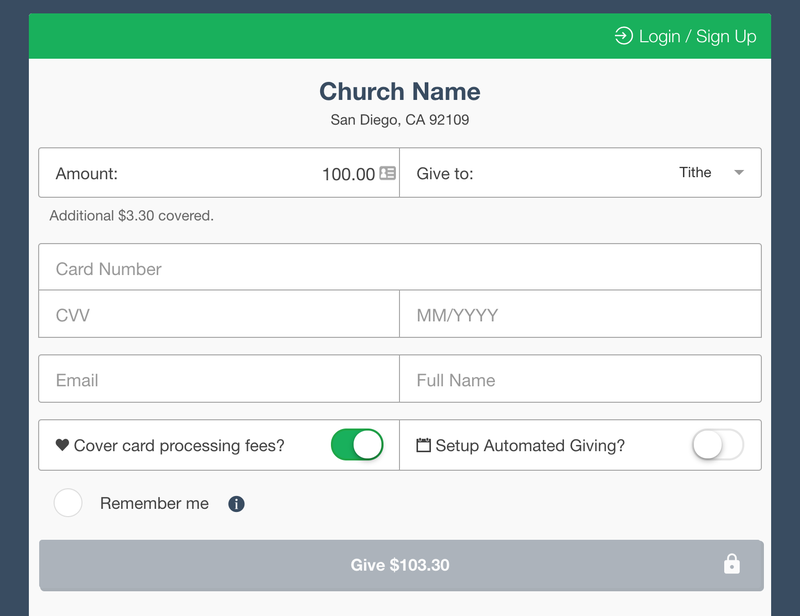 One handy feature is to let the giver opt to cover the payment processing fee so that your church receives the full amount. There are no setup, monthly or annual fees other than the option to offer “Text to Give” for $19/month which makes giving really easy (as in it takes a person five seconds to give, once setup). Here’s a video showing you how giving via Tithe.ly’s mobile app works. Now that you’ve been introduced to Tithe.ly’s online giving solution, let me walk you through the setup process before you actually do it. As of writing, Tithe.ly is available to churches in the US, Canada, Australia and United Kingdom. Check their website or contact them if your church is in another country and you want to use Tithe.ly. It’s possible they will add support for other countries after this article has been published. Go to Tithe.ly‘s website and click the “Sign Up” button at the top right. There are three steps. The first is to provide some basic account information. This is for logging into your Tithe.ly account in the future. The second step is to provide information about your church such as name and location. It’s possible to setup multiple campuses in one account (after signing up) if you want to separate giving in that manner. Lastly, you will need to provide bank details. 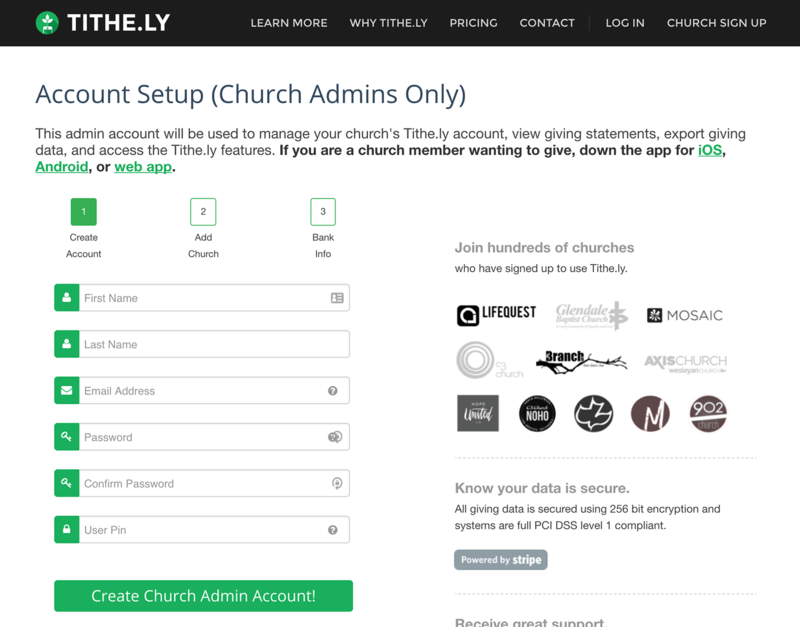 This is for Tithe.ly to deposit what has been given to your church into your church’s bank account. Tithe.ly uses SSL for secure transmission of this information. Note: When you choose a country other than US, the SSN field disappears. At this point you’re all signed up and can now add a “Give” button to your website and start accepting payments in other ways such as via the Tithe.ly mobile app. It’s simple to add a “Give” button to your church’s WordPress-powered website. You don’t even need to install a plugin. Here’s how we recommend doing it. First, go to your Tithe.ly account then click on Website Giving. You will see that there are two options, “Giving Widget” and “Direct Link”. The widget causes a payment form to open within your website when a user clicks the “Give” button. The “Direct Link” option will take the user to a separate page with the same form. They are both good options but since most churches don’t have an SSL certificate (recommended for widget), I’m going to demonstrate the “Direct Link” option. Scroll down to “Direct Link” and copy the URL to your clipboard (highlight it then CTRL-C on Windows or CMD-C on Mac). Next, create a page in WordPress by going to Pages > Add New. You can call it something like “Giving”. Type “Give Now” then highlight that text and click the link icon. 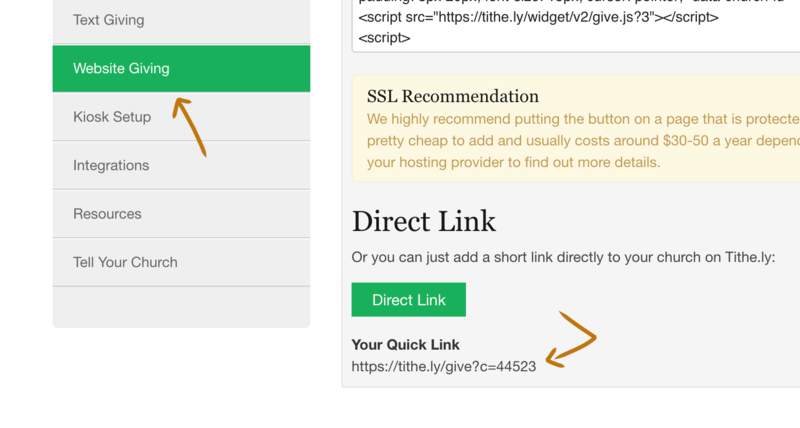 Paste the “Direct Link” URL you copied from your Tithe.ly account. If you are using one of our church WordPress themes then you can make that link into a styled button by clicking on the Text tab at the top-right of the content editor. Find the HTML for the “Give Now” link you made then add a class="themename-button" attribute. Replace themename with the name of your theme in lowercase (e.g. class="exodus-button" for the Exodus theme). Publish your page and you will have something like this with a “Give Now” button directing users to a Tithe.ly giving form. It’s a good idea to explain how online giving works by making it clear that the user can give one-time or on a recurring basis and that they can do it via credit card, debit card or bank account. You may want to mention that they can give via their mobile device and provide a link to http://get.tithe.ly/download-tithely-app/ which tells users more about that. The giving form itself looks like this: https://tithe.ly/give?c=44523. 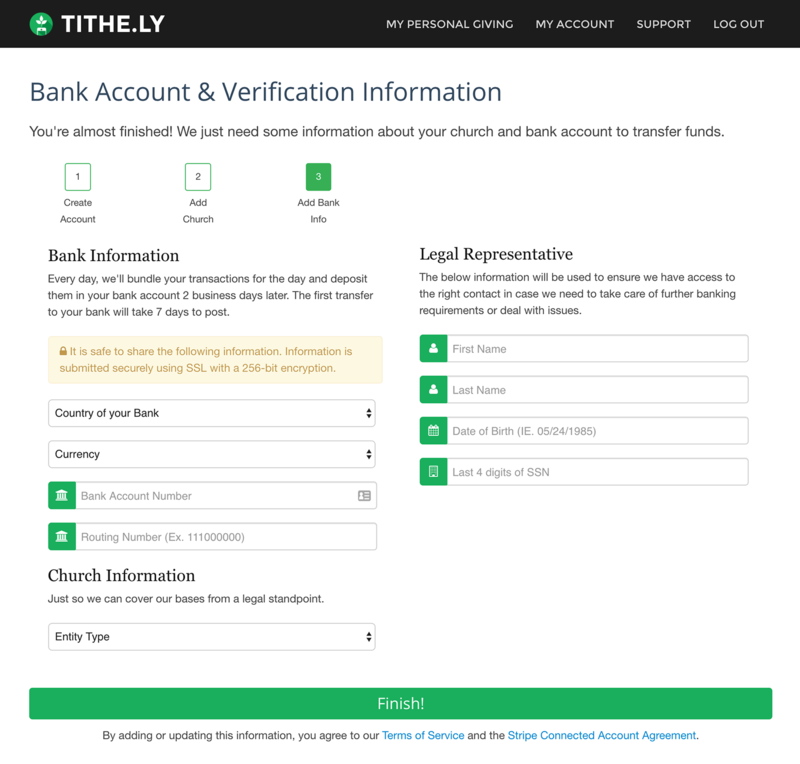 Your Tithe.ly account gives you control over this form in several ways, including the ability to upload a logo and change the color. Notice in this example the “Cover card processing fees” option is demonstrated (we’ve heard that in one church more than 90% opt for this). Note: If you do want to use the widget option with an SSL certificate but don’t want to pay or bother with renewing one every year, see our hosting recommendations (many hosts now include free, auto-installed SSL certificates and will move your site for free). That’s all there is to it. Tithe.ly is a great solution for online giving. It’s easy to sign up and implement a “Give” button on your WordPress powered church website — without even having to install a plugin. And if you are using one of our themes then you can take advantage of styling that makes the button blend in perfectly with the overall design. Have some thoughts on Tithe.ly or online giving? Post a comment. Tithe.ly is fantastic! It is what we recommend to every church that we build a website for at ChurchWeb. I love how easy it is, good it looks, and most importantly…it keeps the giver on the church’s website. I do love that there is the option for the giver to cover the transaction fee if they want to. Not many services out there offer that. Thanks for the comment. You know I thought of you when I wrote this. I like how you’ve been using Tithe.ly. I was impressed when I finally checked them out and, yeah, the option to cover the fee is fantastic for churches to offer. I wonder what percentage of givers flip that on. Well in our church we’ve processed a couple of hundred transactions so far and all but five or six people have covered the transaction fee, so it is pretty high. That is really cool. I’m sure any church who reads this comment will be encouraged. Thanks for sharing that stat. We just started using Tithe.ly last month at our church. It has been a great experience and we have had great feedback from our congregation. It was easy to implement and everyone really likes the simplicity of the app. Thanks for a great step by step guide for setting it up. Cool, Mike. Thanks for sharing your experience with Tithe.ly. I’m glad to hear your flock likes it. That makes me even more excited to share it with churches using our themes. Yes we found out about tithe.ly a couple of months ago. It was very easy to incorporate them into our Maranatha theme, but now I am going to go back and read what you are doing with Exodus more closely and see what else I might do. It seems a lot of our users have discovered Tithe.ly. If you end up using the method in this tutorial and want to use the theme’s button styles, you can just switch the class name from exodus-button to maranatha-button. There are no monthly fees for the church to pay? And people can choose to cover the fee? This sounds too good to be true! And on the text to give option – the church pays a $20 a month fee – and then if a member texts to give – there are no additional fees? Tithe.ly covers their costs by taking a cut of the amount given which can be covered by the giver. You can confirm with Tithe.ly that there are no other costs. I do not think there are. Lane, you’ve got it all right. No monthly unless you want to add text to give for $19/mo. Tex fees apply to all gifts and those giving have an option to cover them. Happy to talk OTP if it would help ensure you’re fully comfortable with the information. Still trying to work out the PayPal route! Good news! Tithe.ly works in Australia, US and Canada. When you choose Australia for “Country of your Bank” in Step , the SSN field disappears. Australian churches are definitely using Tithe.ly. I think you’ll find it to be nicer than PayPal (we don’t like PayPay, anyway). Steven!! Thanks so much for this awesome write up! We love making digital giving simple and think that it’s an important part of a great church website. We also think the work you’re doing at church themes is fantastic! Your tools have helped so many churches publish really well done and useful websites that engage and connect with people in their community. Couldn’t be more honored to partner with you! Thanks Frank. It’s great to finally be able to suggest a giving solution that we believe our users are benefitting from. We hadn’t been able to do that with as much confidence for the first couple of years. Thanks so much for this guide. Our church board independently found Tithe.ly on their own, and when I found out I said, “Hey, our WordPress Theme designer recommended them too!” So your recommendation really helped to give added confidence to our board. 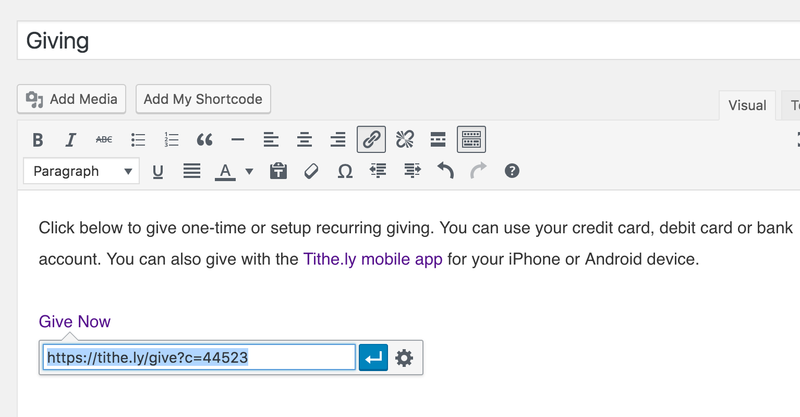 As an added step, I used the Advanced iFrame plugin in the WP plugin repository to insert Tithe.ly’s giving form inside one of our church’s pages. That keeps it within our church’s branding, but also saves our user’s an extra click. An iframe height of 850 px seemed to work well, both for desktop and mobile users. That is great to hear and thank you for sharing your iframe plugin tip. Does anyone have comparative experience with https://givewp.com/ – they seem very similar. Basically free with income earned via selling add-ons. We’re in the UK so support outside the US is essential. I’ve heard good things about the Give plugin but haven’t tested it very thoroughly myself. If you try it, I would love to hear about your experience. Tithely has plans for UK support. Just circling back here as we recently launched in the UK so you’re welcome to give Tithe.ly a try. Let us know if we can help in any way. That is exciting, Frank. I updated the article to mention it. Hi Josue, I’m not sure about this myself but if you go to http://get.tithe.ly/ you can click on the “Click for Help” button at the bottom-left to ask about Spanish and Mexican Pesos.